It is an interesting thought that this music, if not exactly symphonic but speaking a late romantic language and performed by symphonic forces, from the 1930s to the 1950s, was heard by millions of movie-goers. How many of them ever came into contact with �real� symphonic music; still less consider going to a symphony concert. Even so, the films and the music were appreciated, and today composers like John Williams write film music in a largely symphonic idiom, get awards for it and sell records aplenty. It has also become increasingly common to borrow classical compositions for the soundtracks. All this means that more people than ever are exposed to the sound of a symphony orchestra. So why the decline of sales for classical music and receding figures for concert-going? Are we � at least the generations younger than me and most of my reviewing colleagues � so visualised that we need pictures to appreciate the sounds? Pop concerts � reportedly � involve smoke machines and laser projections. I have heard more than one youngster saying: �I�m going to see a concert tomorrow.� A couple of years ago I saw a concert performance of Wagner�s Das Rheingold at the Stockholm Concert Hall in a production that was enhanced by visual effects, projections, texts, colours � you name it. The singers made their exits and entrances as they should in a staged performance and even though some of them needed vocal scores this was a world apart from the traditional �straight� concert version. Reviewers waxed lyrical. The audience were ecstatic � and these were more or less �traditional� concert-goers, versed in concert traditions. Clearly, the visual element has an impact. It probably won�t reverse the figures drastically for the concert halls if they install smoke machines, but maybe something along those lines. Why this preamble? Because knowing the answers, as accounted for above, it must seem absurd to revive 50 to 70 year old film music from movies very few modern listeners - excuse me - viewers, have ever seen, in modern sound-only recordings. But in an absurd world this works, at least for me � and presumably for a lot of others since they continue to sell. Never being a very avid movie-goer I have listened to a lot of movie-music without greatly missing the pictures. It all started in the 1970s when RCA launched their series of re-recordings of classic Hollywood scores. These were in state-of-the-art sound and with the superlative National Philharmonic Orchestra conducted by Charles Gerhardt. Herrmann, Waxman, R�zsa and Korngold became household names and I soon realised that all of them had �serious� careers as well. It was comme-il-faut in some camps to frown upon this music � sentimental and vulgar � and considering the last-named he was regarded as �more korn than gold�. However times change and it wasn�t long before a Korngold revival was on its way. Die tote Stadt appeared on disc, also on RCA, a new recording of the violin concerto - in which he recycled several of his film themes - the string quartets and then a steady stream of orchestral music (on Chandos and CPO). Then came the rest of the operas. Today Korngold is firmly established, the gold having got the upper hand over the korn. I focus on Korngold since he gets star billing on the cover of this issue, even though the music from Captain Blood is only marginally longer than the Young and Steiner suites, and this is music with a tingle factor! The Main Title was on one of those RCA records. This film was Korngold�s real break-through and established him as one of the top contenders � many regard him as without peer. For inventiveness, melodic and harmonic richness and a symphonic approach he is hard to beat. Here I return momentarily to the fact that through Korngold millions of non-classically oriented viewers got a healthy dose of symphonic music. What makes his music so congenial is its graphic quality. It is illustrative to the point when you hardly need the pictures, and that is also one reason why it is so listenable disengaged from the movie. One can hear this on track 12 of this disc. Elsewhere he creates � or rather underlines � the mood of a scene; listen to the chilling beginning of the Port Royal scene (track 14). Of course a full appreciation of Korngold�s idiom also requires a listener with a sweet tooth. When he lets loose his most seductive string tunes (also track 12) you may feel that he is over-sugaring the pudding. Then, when you have reached a near-diabetic stage, he adds some bold harmonic seasoning to neutralise the sweets and, who can resist his melodies? Add to this the rich orchestral texture where Wagner, Strauss, Mahler and Puccini were his masters. There is also a small (only 1:45) but exquisite pearl, Tortuga (track 13), a slow Boston Waltz with rubatos that even Franz Leh�r would have envied. He wrote an enormous amount of music for this film in only three weeks but a tight time-schedule forced him to borrow a few minutes from a symphonic poem by Liszt for a battle scene. This caused him to demand that the credits read �Musical Arrangements by Erich Wolfgang Korngold�. Modesty indeed! I will be more brief about the rest of the disc although I hasten to add that I enjoyed these three scores, too. R�zsa�s The King�s Thief includes some whistling and the music has, appropriately enough, a true 17th century feeling, even though the instrumentation is of later vintage. And R�zsa was of course one of the greatest, with around ninety film scores to his credit and being at his very best in some historical epics like Ben Hur and Quo Vadis. 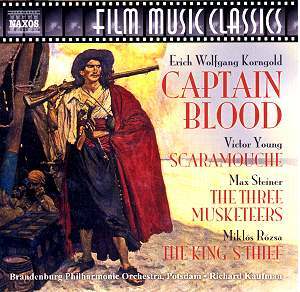 Victor Young, best known for his score for Around the World in Eighty Days wrote a really catchy main title for Scaramouche, whereas the second scene, Vanished Merchant (track 3) has a certain thematic likeness to Around the World although composed three years earlier. I must admit that while being wholeheartedly in love with Korngold�s �sugar music� the corresponding side of Young is harder to take, mainly because his sentimentality is not redeemed by Korngold�s brave harmonies, but he writes fine melodies and the End Cast (track 10) is accompanied by a lilting waltz. Max Steiner was Korngold�s senior by nine years and started writing for Hollywood several years before Korngold arrived from Europe, reaping success in King Kong (1932). He also won an Oscar for The Informer the same year that he wrote the music for The Three Musketeers (1935), a film which has not gone down in the annals as a masterpiece, but was probably partly redeemed by the music. This is a score that bristles with energy and zest (tracks 17, 19, 21), but he could also write a tear-jerking love theme (track 18) and what I suppose is the Pigeons� Theme on track 20, is distantly reminiscent of Whistle While You Work from Snow White. The whole disc was a good listen, with an extra plus for Korngold. The orchestra, only two years after its foundation, acquit themselves well. They may not have the refinement of the National Philharmonic but in the excellent Jesus Christ Church in Berlin (Dahlem) � a famous recording venue for, among others, the Berlin Philharmonic before the days of the Philharmonie � they produce a mighty sound, comparable to the Kingsway Hall, where the RCA recordings were made. Tony Thomas writes a well-informed note in the inlay, but I would have liked some more explicit clues to what happens in the different scenes. There is also a note on reconstruction by John Morgan, responsible for the Korngold and Steiner excerpts. He regrets that the original scores do not exist any more and that the reconstructions had to be made from original piano reductions, warts and all, and through listening to the sound tracks; a painstaking job that we have reason to be extremely grateful for. Provided you have at least the remnants of a sweet tooth and don�t mind unabashed wallowing in lush late-romantic orchestral sounds, this can definitely be a disc for you. I won�t be separated easily from my copy.